From an ancient Greek grave at Pylos, Greece excavated 2 years ago, archaeologists have discovered, almost by accident, a remarkable finely carved stone depicting an ancient fight scene. Back then though, this artifact just looked like a small crusty bead no more than half an inch long. It was overlooked for the gold rings and other treasures in the tomb. Much later, a conservator made this discovery when removing the lime accretions on the bead, revealing a big surprise from this tiny artifact. Finely carved into this gemstone was an image of three warriors fighting, with one already defeated on the ground. “The detail is astonishing, especially given the size. Aesthetically, it’s a masterpiece of miniature art,” said John Bennet, director of the British School at Athens, an archaeological institute. 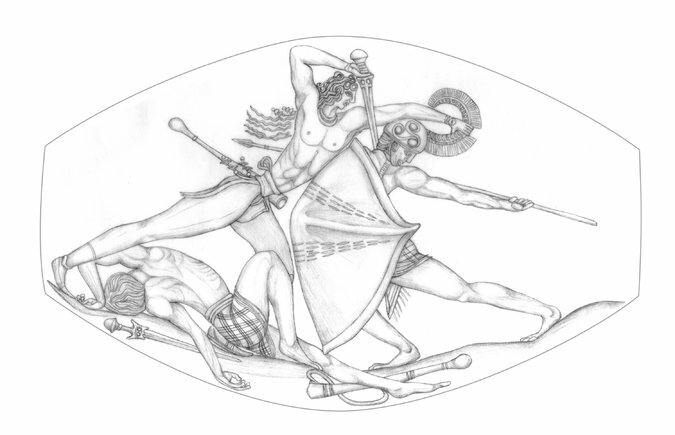 “The stunning combat scene on the seal stone, one of the greatest masterpieces of Aegean art, bears comparison with some of the drawings in the Michelangelo show now at the Metropolitan Museum of Art,” said Malcolm H. Wiener, an expert on Aegean prehistory and a trustee emeritus of the Met. The help you appreciate the significance of this find, the ancient Greek grave was found by archaeologists Jack L. Davis and Sharon R. Stocker from the University of Cincinnati after digging for over 25 years. They named it "The Pylos Combat Agate" yet there's still some mystery to it. The owner of the grave is known as the Griffin Warrior because this mythical creature is depicted therein. He was buried around 1450 B.C. and lived during the transferring of Crete cities to the Greek mainland. Dr. Davis and Dr. Stocker believe this precious seal stone was made on Crete and used to symbolize his membership as a Greek elite. The seal stone is mounted for wearing on the wrist like the depicted hero who is also wearing one. This is more than a cool bracelet, it inspires its wearer with the vigor and valor of the hero to defeat your enemies even when outnumbered.